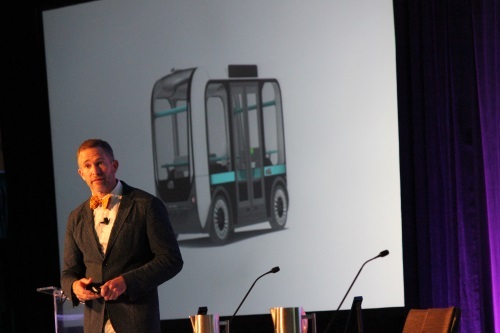 Focusing on the deployment of ‘low speed’ autonomous vehicles, especially in mass transit applications, may be the key to their acceptance by the general public, argued Jay Rogers (seen above, photo by Georgia DOT), CEO and co-founder of LM Industries – the parent company of Local Motors – during the keynote speech at the annual meeting of the American Association of State Highway and Transportation Officials in Atlanta. To help encourage more communities to find “use cases” for Olli shuttle, Rogers said Local Motors developed an “autonomous fleet challenge” that would provide 10 “pods” of Olli vehicles – with each “pod” comprised of five to 10 units – to 10 major cities over the course of the next 10 months for free. The first “pods” from this program, which launched Sept. 28, are headed to Phoenix, Arizona, and Sacramento, California, he noted, with initial “use cases” focused on providing transit at college campuses, hospital facilities, even for late-night transport back from amusement parks. He said 3-D printing is dramatically changing how vehicles of all stripes can be built. “We can make a vehicle five times faster with 100 times less capital,” Rogers explained, noting that Local Motors can now “print” the vehicle chassis in roughly 10 hours, with the wheels and electric propulsion system added afterwards. “The automotive industry today works on a 7-year development cycle; we at Local Motors propose a 6-month development cycle,” he added. Ultimately, the goal of self-driving vehicles such as the Olli is to help boost human productivity – something Rogers said should be the “true measure” of a nation’s wealth.